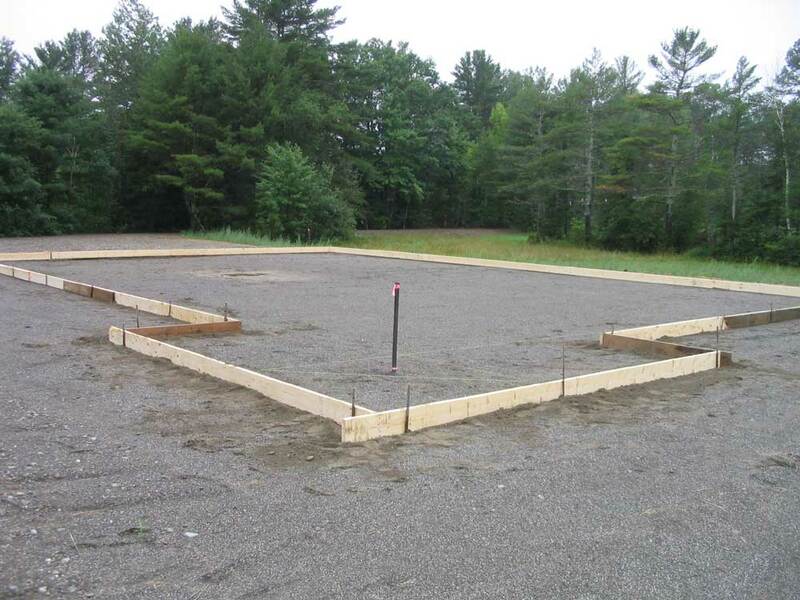 With the planning complete and a basic design and quotation in hand, it was time to continue with the actual construction. 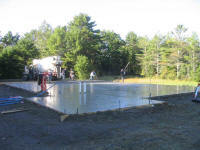 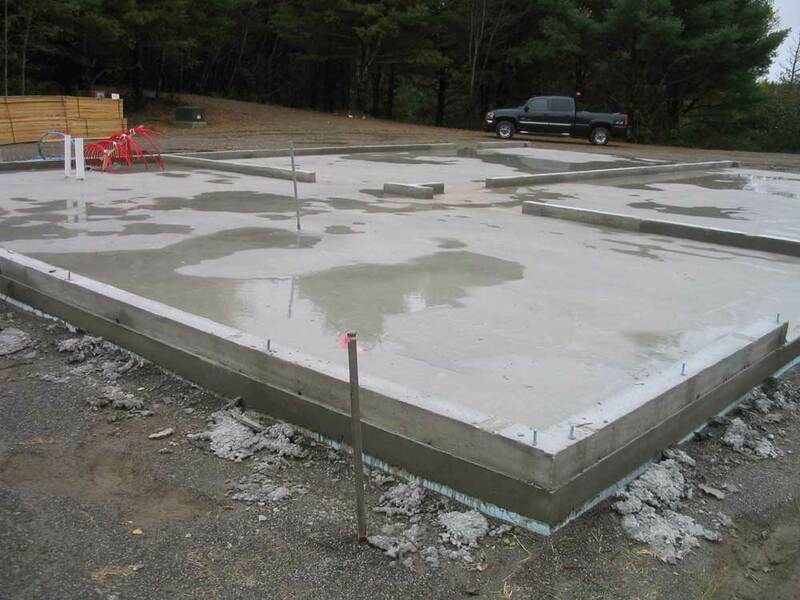 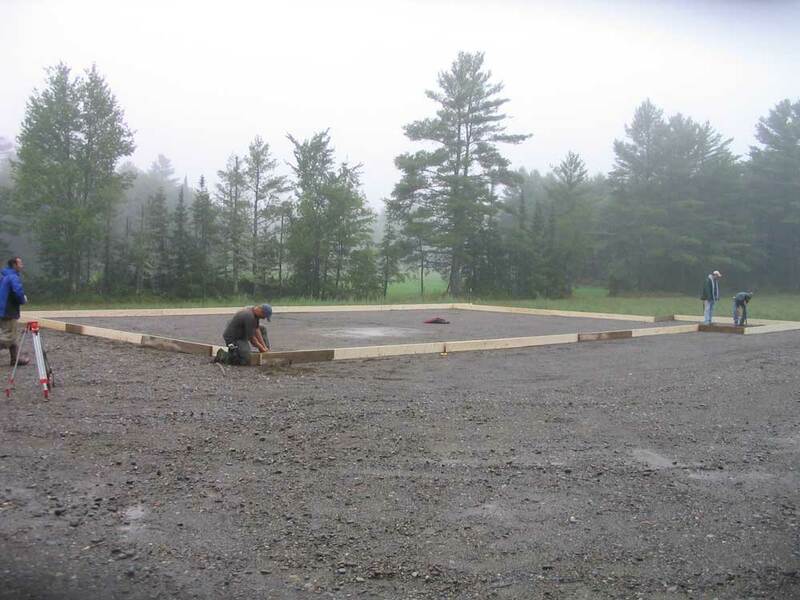 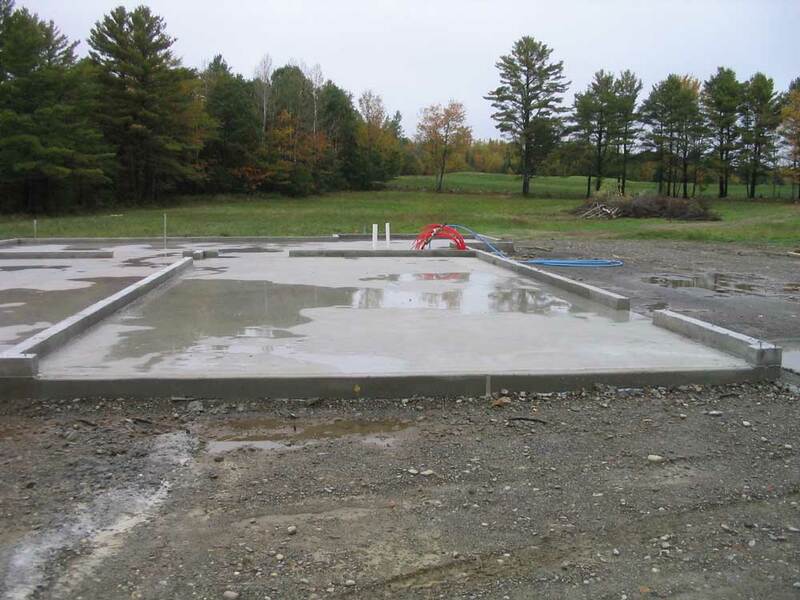 The first step was to arrange for a new driveway to be built, along with a large, level pad on which the shop slab would be poured. 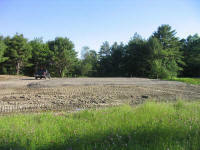 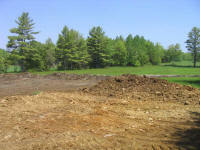 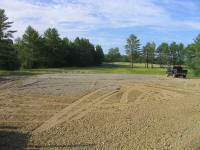 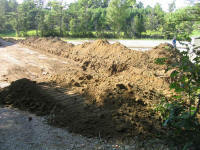 After some preliminary meetings in May, the driveway construction finally began in early June. 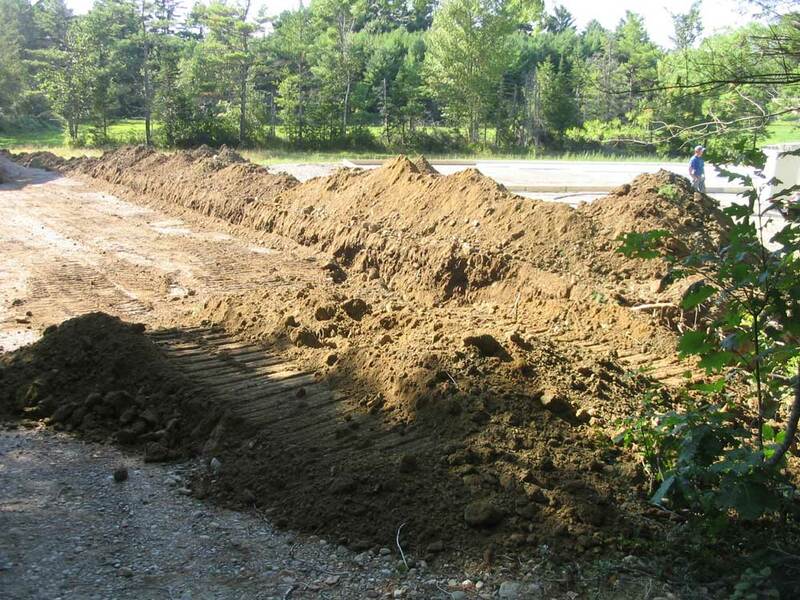 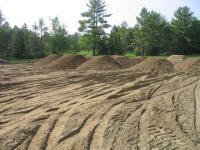 The driveway needed to be fairly rugged to prevent softness and damage during mud season, particularly given the chance that large, heavy trucks bearing boats might be traveling over the drive. 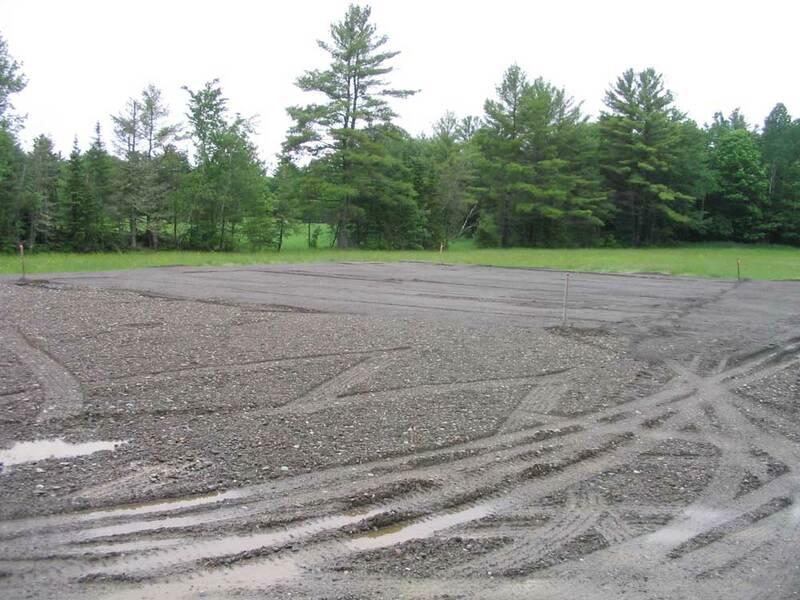 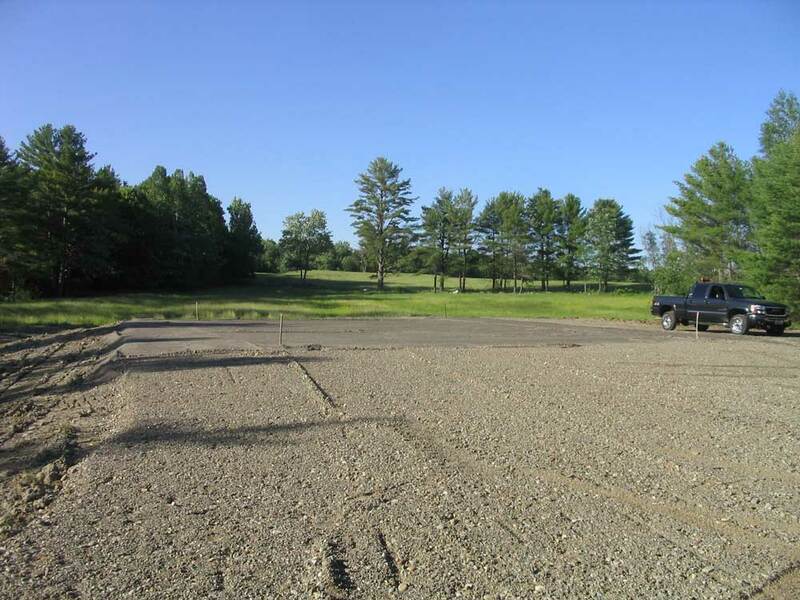 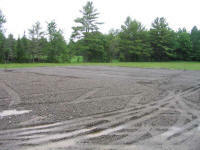 Therefore, the excavation contractor specified a base of heavy 6" gravel, followed by additional 3" gravel and finished off with 2" gravel as the top surface. 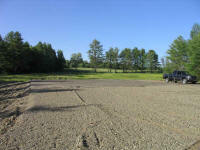 Numerous loads of the coarse gravel made up the pad beneath the shop location, which needed to be raised as much as 3-4' in some areas. 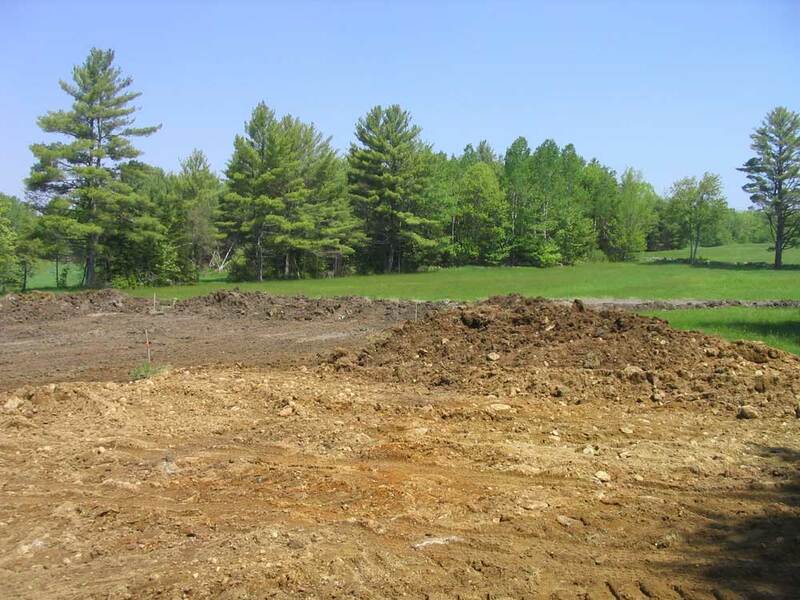 In addition, we had to do some resculpting of the landscape to allow for better drainage of water past the site, so the contractor took care of all this as well. 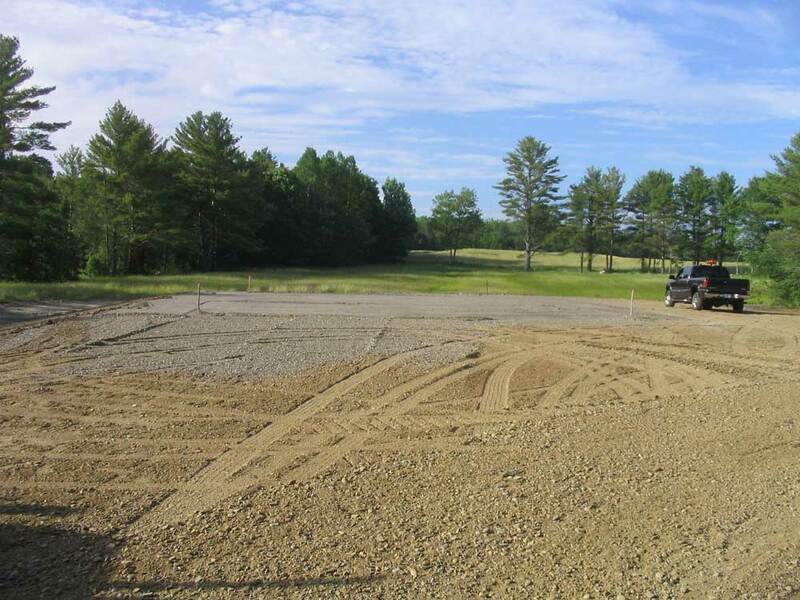 After several days' work, the construction was complete, allowing me the pleasure of driving into the property for the first time since we gained ownership back in March. 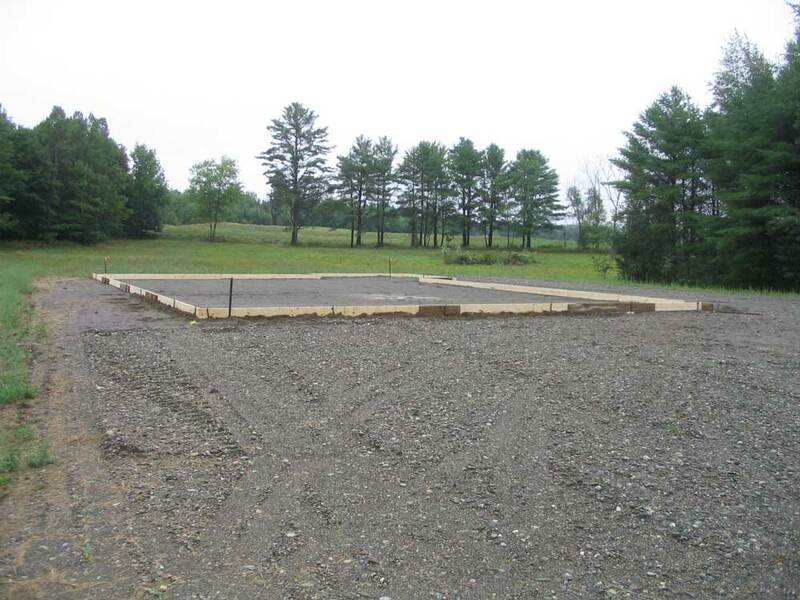 The new pad where the shop would eventually go looked nice, and began to give a sense of the location and the size of the building. 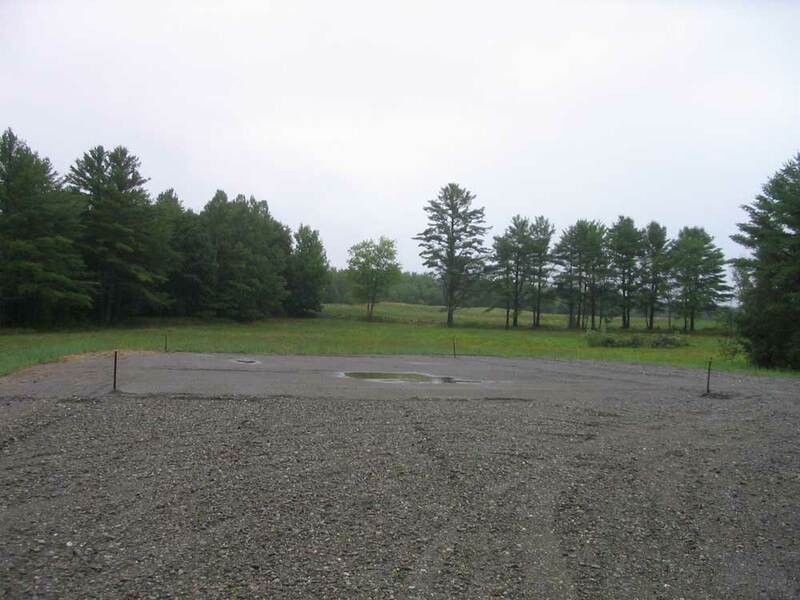 Of course, the landscape looked somewhat disturbed at this point (and this would get worse before it got better), but with some vision one could see how things might end up when all was said and done. 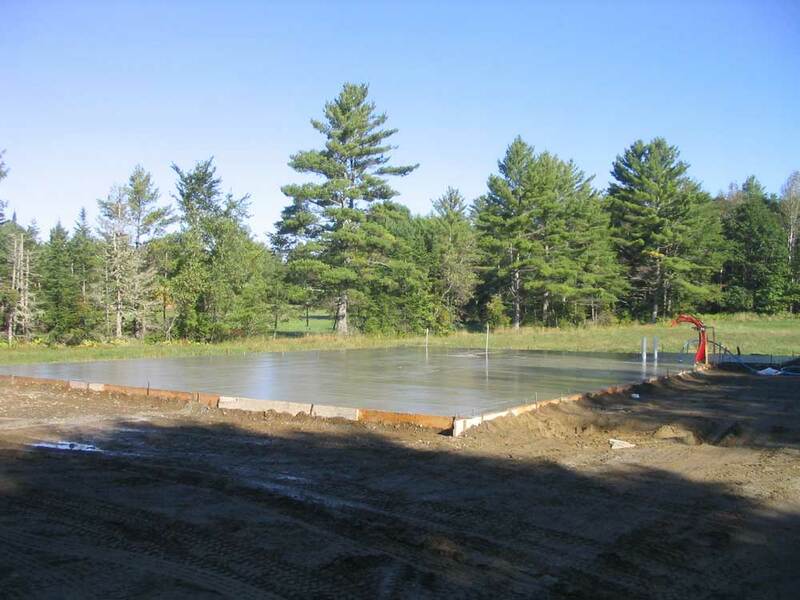 With the pad and driveway complete, the next step was to arrange for some of the infrastructure required--electricity, septic, and water. 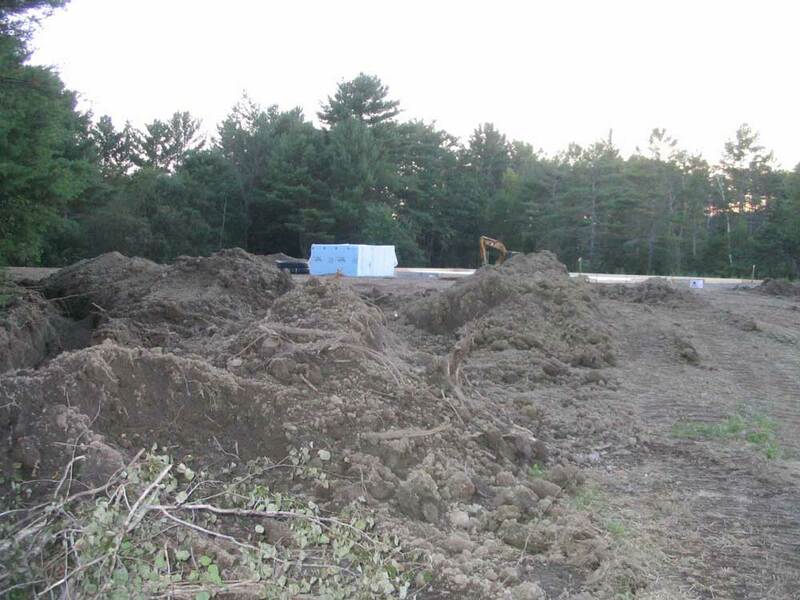 Shortly after completion of the driveway, the well drillers arrived to drill a new well, up closer to the house site, which was located further into the property from the shop. 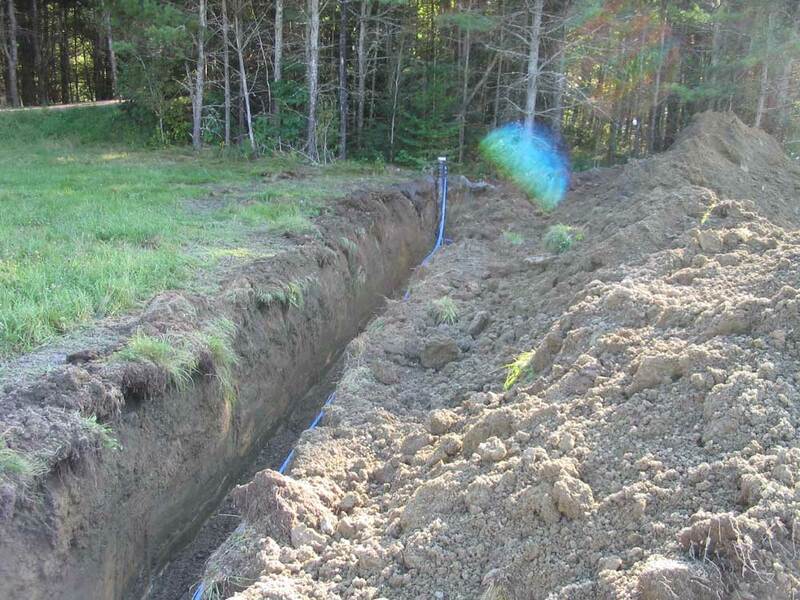 We decided to go with buried electrical service, and after a number of more or less frustrating calls and meetings with the local power company, managed to obtain the proper quotes for primary 200 amp service, customer-owned meter and pedestal, and secondary wiring from there. 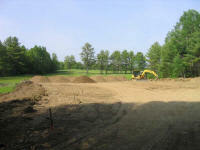 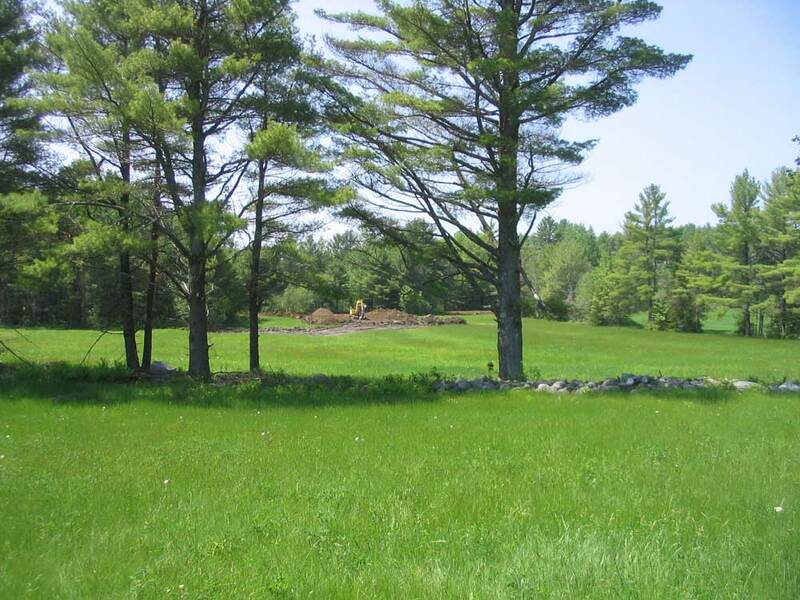 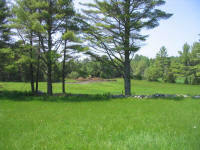 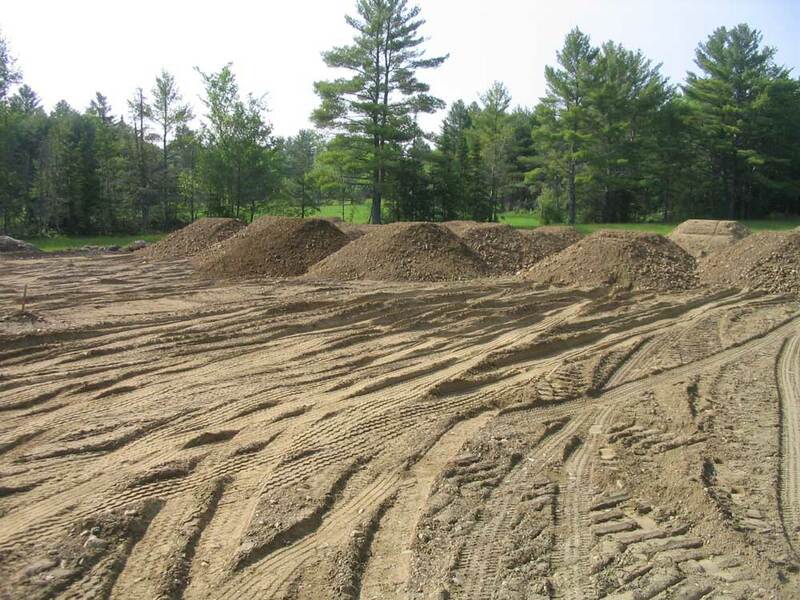 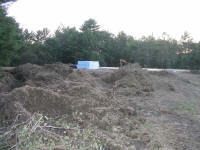 Shortly thereafter, the excavation contractor returned to trench for the buried power, water, and septic system, and before long the property looked as if huge moles had been left to run free. 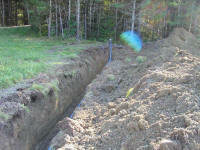 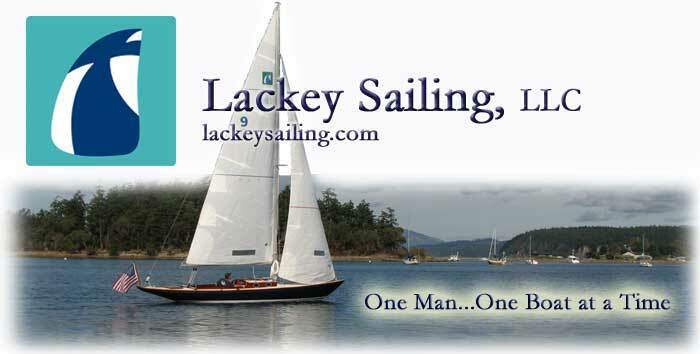 After nearly a week of work, all the trenches were dug, the conduit, cable, and piping run, the leach field and septic system installed, and the trenches backfilled, returning the land to some semblance of its former self. 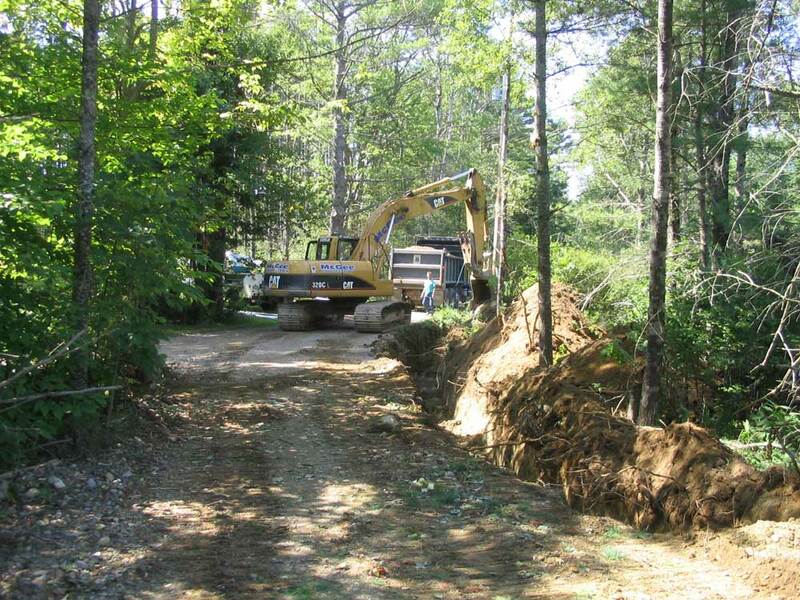 After a couple weeks and some false promises, the power company hooked up the electrical service on September 28, completing one of the more frustrating processes. Meanwhile, work continued on the slab. 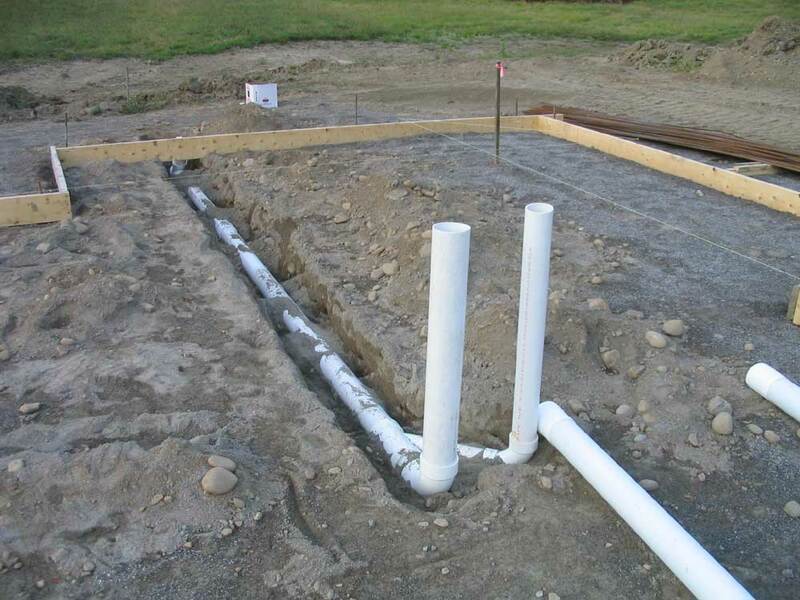 One day, the foundation crew arrived to locate and build the forms for the slab, after which I could locate such things as the plumbing for the bathroom and the conduit carrying the potable water lines. 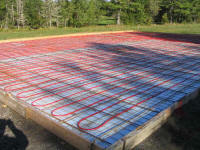 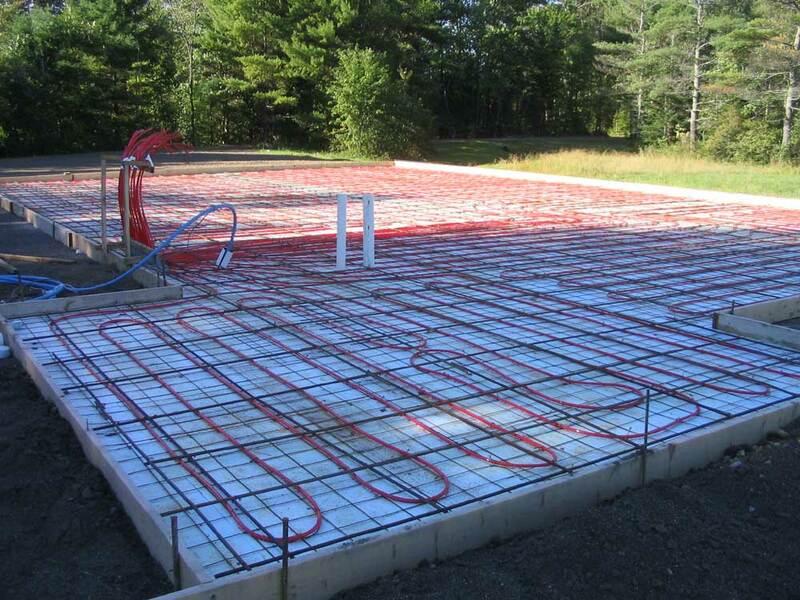 My builder, Bob Emery, installed styrofoam insulation on the ground, then installed a wire mat to which the heating contractor could attach the plastic tubing needed for the radiant floor heating. 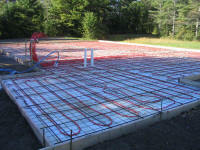 Finally, Bob installed the rebar above the newly-installed tubing, and a conduit that would eventually carry electrical wires out to the center of the shop where the table saw would be. 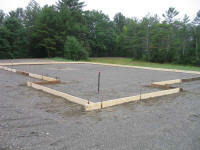 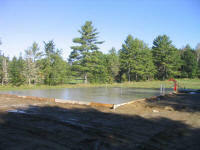 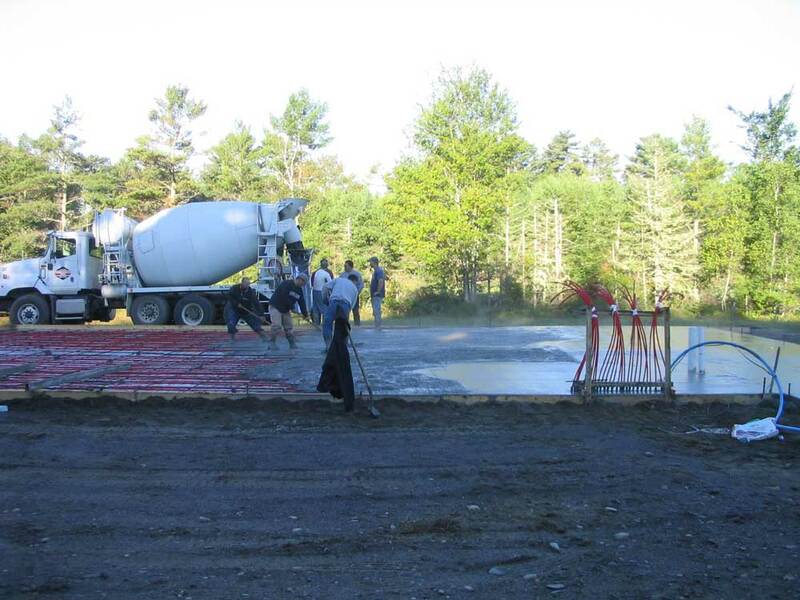 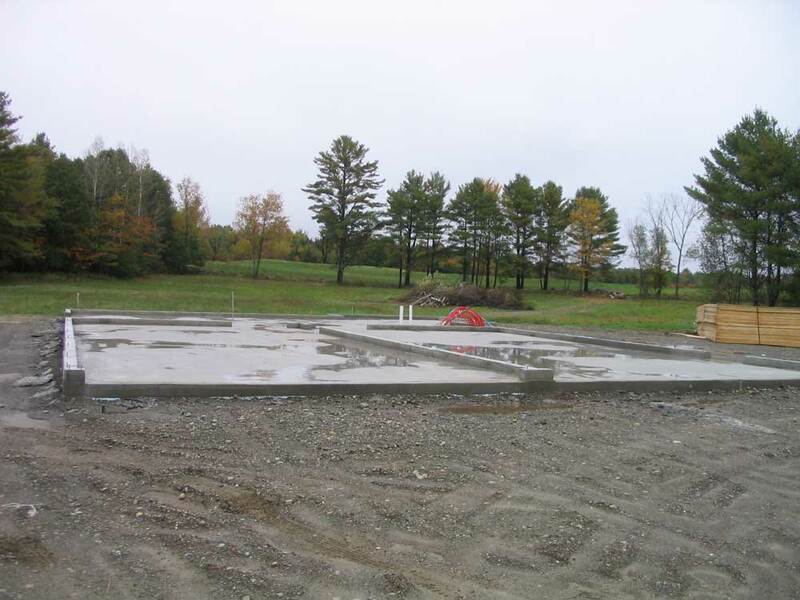 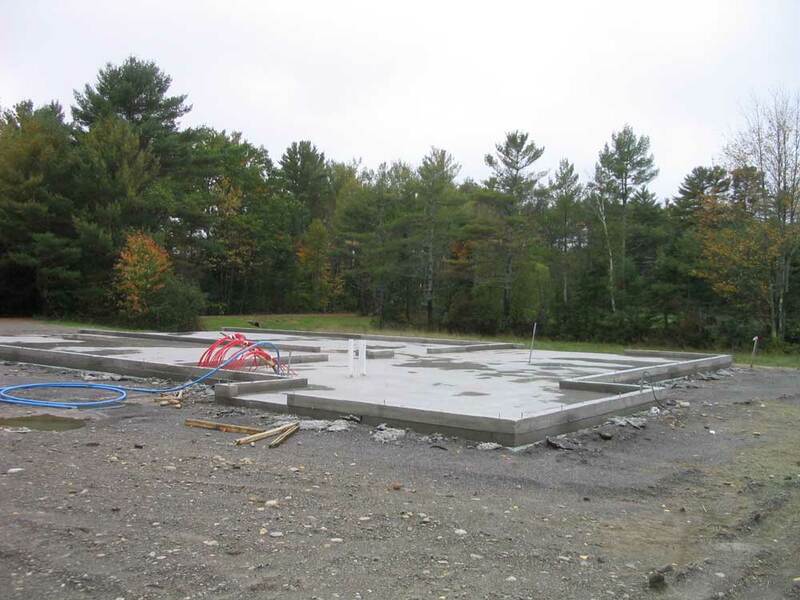 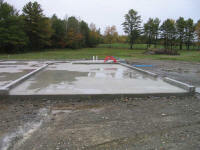 Shortly thereafter, the day arrived when the slab would be poured. 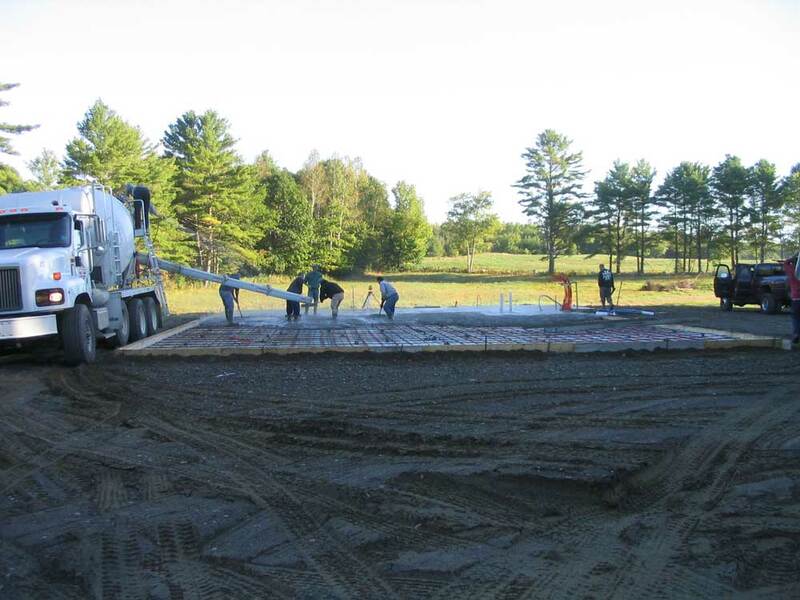 Beginning bright and early in the morning, a stead stream of concrete trucks arrived--six in all--and dispensed their cargo into the forms, where a large crew spread, leveled, and smoothed the product. 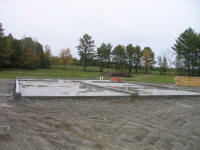 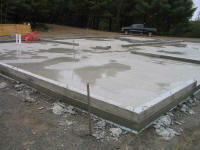 Several days later, the same crew formed up the curbing, and poured the curb, completing the shop foundation.